Designed specifically for small scale web site developers and graphic designers. Includes contracts for small web site and design projects. Order and download for $89. See our Proposal Kit Professional for the all-inclusive bundle including all of our proposal, contract, estimate, sample, project planning content and Expert Edition software. I was about to land my first large contract, but I didn't have a contract for them to sign! 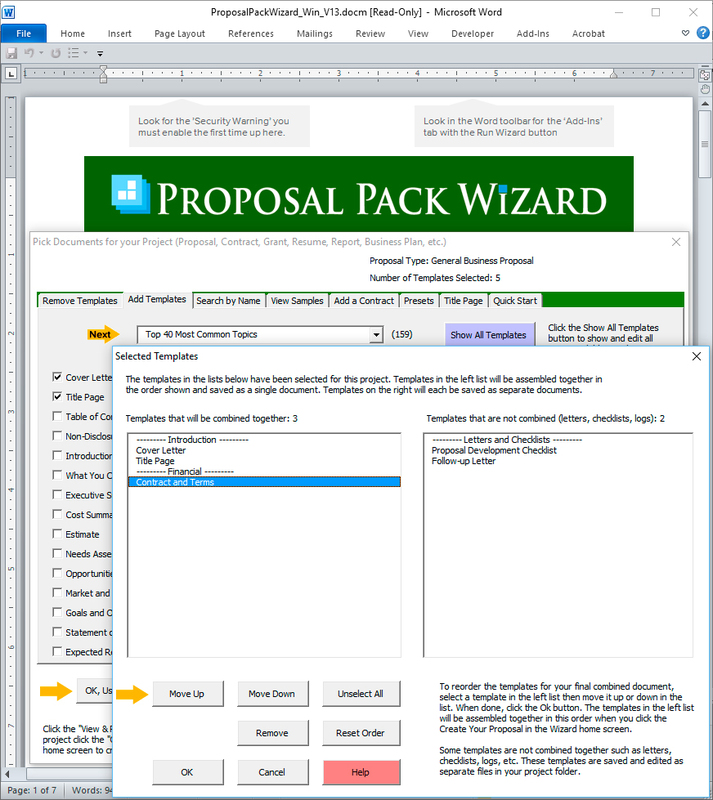 I ordered Proposal Kit Pro, downloaded it immediately and had a contract with all attachments ready! The contract was great and it had a lot of clauses in it that I would have never thought of. 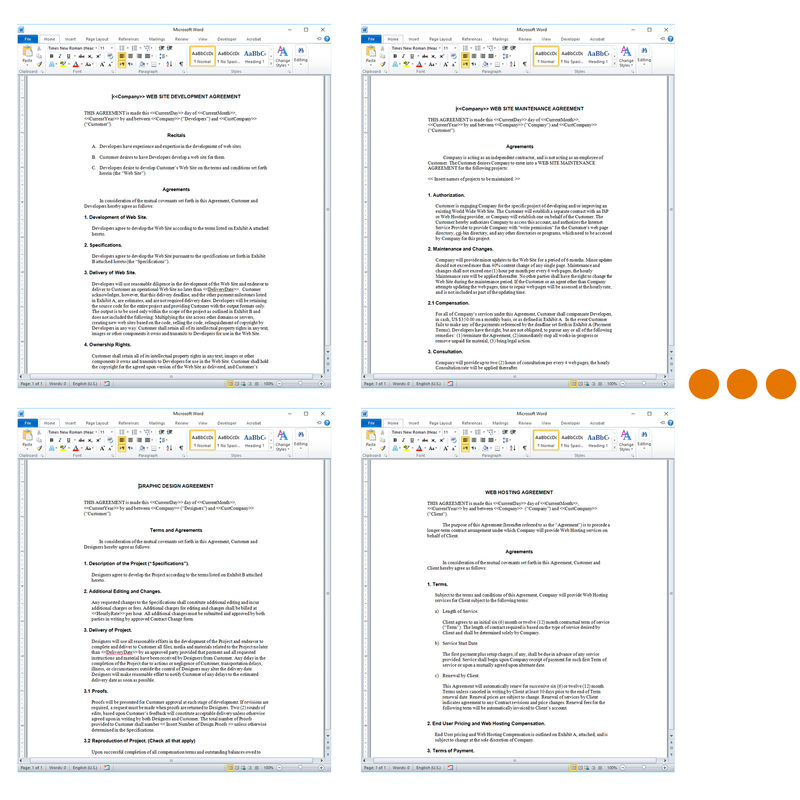 I would definitely recommend Proposal Kit to anyone in need of contracts." three or four important clauses that our existing client contract overlooks." Contract Pack contains a large collection of extensive contracts. Use them as-is, modify them for your own custom needs and/or use them to improve the quality and protection of your existing contracts with new clauses. Contract Pack includes material for pre-project protection, project development, project and contract changes, intellectual property protection, project acceptance, policy disclaimers for public posting, problem notification and much more. Web Freelancer Contract Pack is designed for use by small scale web site developers and graphic designers and is low-cost and immediately downloadable. Supports many platforms: Microsoft Windows, Mac, Linux, Microsoft Word, Office 365, Microsoft Office, OpenOffice, StarOffice, Word Perfect, Google Docs, iWork, Pages and Appleworks. 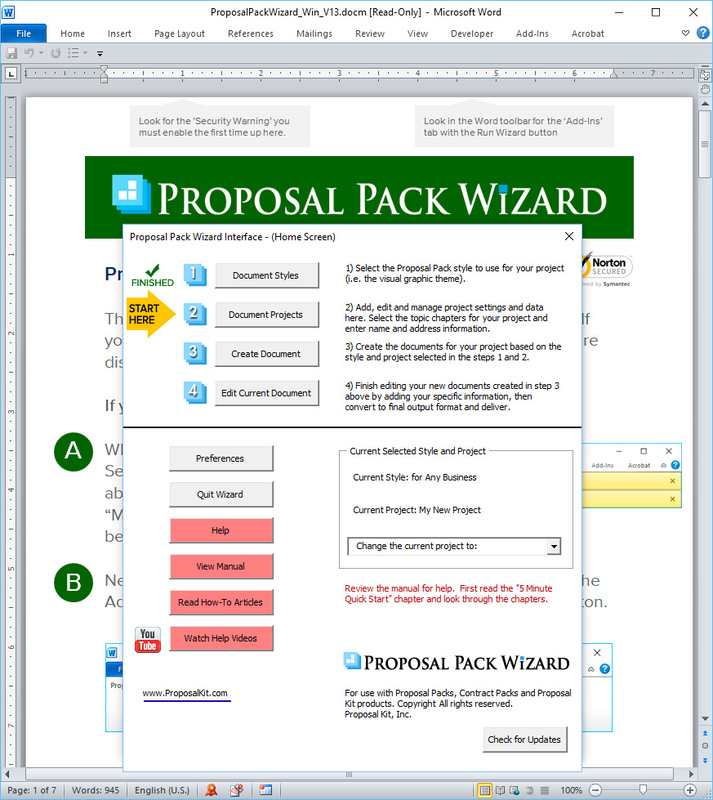 While you can use the Contract Pack as a stand-alone collection of templates on any operating system or word processor, you get even more power and capabilities when it's combined with the Proposal Pack Wizard Software. The optional bonus Wizard software requires Word for Windows that can run macros. Using just one of our contracts, even if you require it to be reviewed by your own attorney or solicitor, will save you much more than the cost of the entire package. Using our materials as starting points, editing yourself, then having your own attorney or solicitor review it will cost you many times less than having one created for you. To see for yourself, contact one or more attorneys and request a quote to have a contract designed. Then request a quote to have a contract you will supply with your notes simply reviewed. You may find quotes for $1000 to $3000 for the first request and $100 to $300 for the second request. 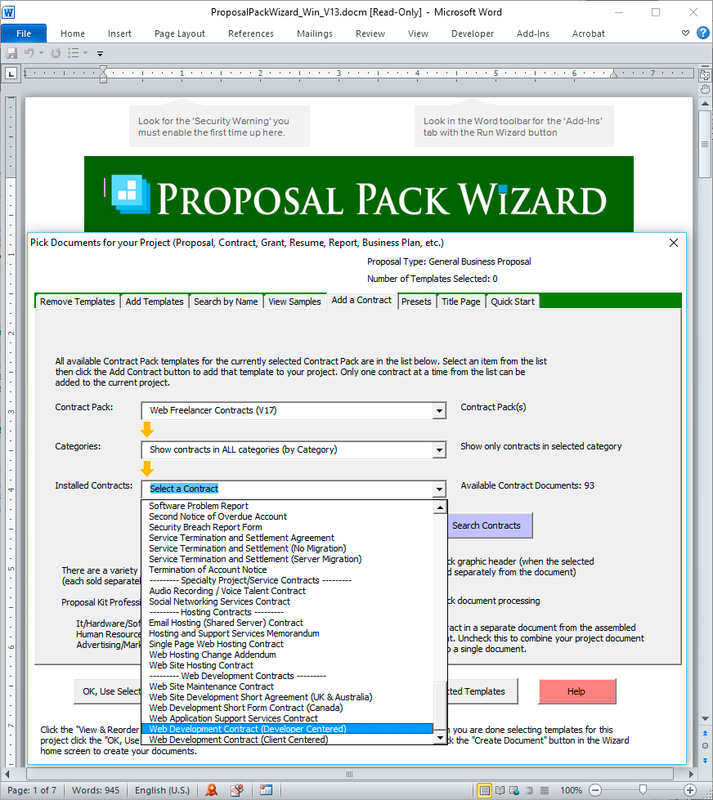 Proposal Kit Professional contains over 340 contract documents (over 1000 pages of material). Disclaimers: Proposal Kit, Inc. makes no warranty and accepts no responsibility for suitability of any materials to licensees business. Proposal Kit, Inc. assumes no responsibility or liability for errors or inaccuracies. Licensee accepts all responsibility for results obtained. Information included is not legal advice. Use of any supplied materials constitutes acceptance and understanding of these disclaimers.